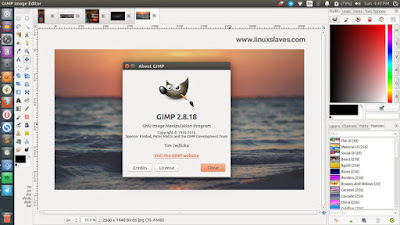 Gimp Latest Stable Version - GIMP is an acronym for GNU Image Manipulation Program, is free & open source great image editor program alternative image editing programs Adobe Photoshop or Corel Painter. It's a freely distributed program for such tasks as photo retouching, image composition and image authoring. You can use Gimp for producing icons, graphical design elements, art for user interface components, mockups, with many customization options and 3rd party plugins. It's available for major operating system including GNU/Linux like Ubuntu, Elementary, Linux Mint, Mac OS X, and Microsoft Windows. GIMP can also run on Solaris and available for the BSD family of systems such as FreeBSD and OpenBSD. This free image manipulation written and developed under X11 on UNIX platforms. Even though GIMP is free software, it doesn't put restrictions on the kind of work you produce with it which means you can use GIMP for commercial purpose. In the past, I have shared the development version. You can read the post at Gimp 2.9.3 ships new dark themes. Now I'll tell you how to update this great digital image manipulation software to Gimp 2.8.18 from older version. This works for Ubuntu 12.04 LTS Precise Pangolin, 14.04 LTS Trusty Tahr, 15.04 Vivid Vervet, 15.10 Wily Werewolf, 16.04 Xenial Xerus, 16.10 Yakkety Yak, Linux Mint 18 Sarah, Linux Mint 17.1 Rebecca, Linux Mint 17 Qiana, Linux Mint 13 Maya, Elementary OS 0.2 Luna, Elementary OS 0.3, Elementary OS 0.4 Loki and derivatives. Press Enter to confirm and continue. The system will creating and requesting key from from hkp server keyserver.ubuntu.com. The APT will tell you the size package. It needs to get 19.8 MB of archives and 13.5 MB of additional disk space will be used. Confirm the installation dialog by pressing y. Sit back and grab a cup of coffee! That's it! Enjoy your new Gimp! That's all I can write about a guide to Update/Install Gimp 2.8.18 stable on Ubuntu and derivatives system. Hope you've enjoyed reading this tutorial as much I’ve enjoyed writing it. Thanks for visiting us.